The way Carrie Neighbors sees it, an investment of about $20 a month lets shoppers from around the world browse through the merchandise in her Lawrence store. That’s how much Neighbors, co-owner of The Yellow House, estimates it costs her to operate two webcams that she recently had connected to her store’s Web site. She said she spent about $300 to have the system installed. Neighbors believes her variety store, at 19th and Massachusetts streets, is the first store in Lawrence to install webcams, which are mini-cameras that send out live images on the Internet. “I thought if I can get on the Web, I can reach the whole world,” Neighbors said. But Neighbors didn’t want to do just a typical Web site. Her 20-year-old son, Alex, suggested the idea of webcams. An avid Web surfer, Alex said he noticed sites that had webcams and said they seemed to be popular with users. So Neighbors bought two cameras. She points one at a different type of merchandise every day and another at the front door and cash register area so viewers can do a little people-watching. Neighbors eventually wants to start shipping items from the store around the world to customers who log onto the Web site. But for now she is hoping the cameras catch the interest of Lawrence Internet surfers. The site received 3,000 hits this week, its first week in operation, Neighbors said. She said store visitors also liked the webcams. Webcams feed live footage of the Yellow House, 1904 Mass., to the store's Web site. Owners Guy and Carrie Neighbors, whose images are broadcast on the computer via the webcam, think their store is the first in town to use the cameras. Neighbors hopes to expand on the idea. The store is in the process of hooking up a wireless webcam. With the wireless webcam, a customer could call up the store, ask about a particular piece of merchandise, and a store employee could move the camera in front of it to allow the caller to look at it over the Internet. Neighbors also said the wireless webcam could be put back in the store’s service department so customers could watch technicians work on the appliances. Neighbors believes the webcams eventually could boost sales at the store by 50 percent. But they also will pay off in other ways, Neighbors said. She leaves the cameras on 24 hours a day to serve as a makeshift security device. 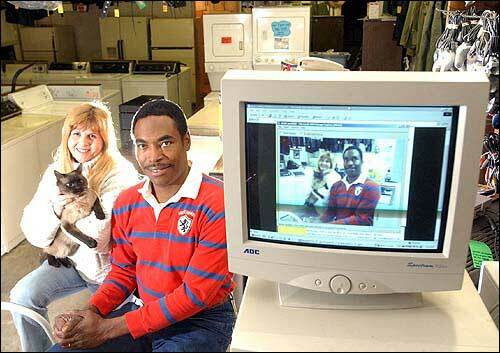 The Yellow House may be the first store in Lawrence to give webcams a try, but the Lawrence bar market ventured into the world of webcams years ago. The Sandbar, 117 E. Eighth St., installed a webcam in the early 1990s. Co-owner Peach Madl said it had been a good way to generate additional excitement at the bar. The bar, though, has had to take some precautions to protect the privacy of patrons. The camera is set up in a way that makes it hard to identify individuals, unless you know who you are looking for, Madl said.